Runar Enberg, a Swedish film photographer, has produced a documentary film about people, places and events along the Vindel River. The first opening night of the film took place on the Vindel River (!!) in the middle of Sorsele on January 23rd 1999. 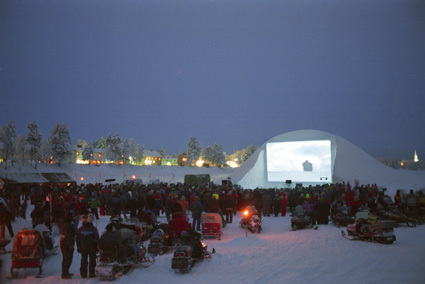 This was as far as we know something unique, an out-door cinema performance in the dark and cold January evening on the Vindel River, covered with thick ice and white clean snow. There was bulit a huge film screen made of snow, 20 feet high and 35 feet wide. The benches were also made of snow. There was a snow mobile drive-in, a market with local food and beverage, an opening ceremony with fairy dance and fireworks. The cinema was decorated with cressets and warming fires.